Tag Archives for " Intuit "
Like it or not tax time is upon most small business folks. So, it seems like a good time to give away copies of Intuit’s Turbo Tax Business Software don’t you think. As an element of Make a Referral Week I’m going to draw 15 names from the businesses your refer today and send them a copy of Turbo Tax. Here’s the deal, go Make a Referral here and when you do you’ll also be entering a business you love for a chance to get picked randomly to win a copy of Turbo Tax courtesy of Office Depot. And, I’ll also pick two businesses you refer to get a Canon SD780 digital camera so they can take pictures of all those new customers they land because you made a referral. So, what are you waiting for – go Make a Referral and make sure you share their contact information or website so we contact them if they win. I’m in Chicago today and Friday (Nov 1-2) for a very cool traveling event put together by Intuit. The JustStart Pop-up event is being help at Union Station and features lots of interactive opportunities along with the chance to register to win $50K in cash and prizes for your business. You can read all about the contest here. I will be on site and I do believe you can snag a copy of my book. If you’d l will even deface it for you! Come by and say hi. I hear from lots of folks kind of, sort of, maybe wishing, they could start their own business. To them I say, Just Start! There has never been a better time to start a business, period. In fact, the folks at Intuit just made it an even better time to start a new venture with a national campaign aimed at helping aspiring entrepreneurs get into to business now. 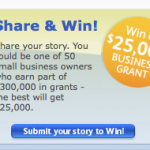 The highlight of the campaign is a $50,000 grant awarded to one lucky start-up. Aspiring business owners can enter the â€œJust Startâ€ contest by submitting a letter or video to www.IWillJustStart.com, or by visiting one of the local â€œJust Startâ€ events in four major cities. Entrants will describe their business dream, what they need to do to make it happen and how they would use Intuitâ€™s â€œJust Startâ€ business grant to get started. Budding entrepreneurs can experience â€œJust Startâ€ in four busy commuter hubs across the country. At each â€œJust Startâ€ Lounge, they can enter the contest by sharing their business dreams on video. They can also draw inspiration from local entrepreneurs, obtain expert advice from local business experts and get a free copy of QuickBooks Simple Start. Seattle â€“ Oct. 24-25, Westlake Center. New York â€“ Nov. 7-8, Grand Central Station. Boston â€“ Nov. 13-14, South Station. Visit the I will just start page to get a feel for the types of entries. Scrolling through some of the video entries is a great way to get fired up about your dream. The contest entries are due by December 15th and the winners will be announced in January 2008. I have been asked to judge the entries, along with Anita Campbell of Small Business Trends and Ramon Ray of Smallbiztechnology.com. We will review the submissions and select five semi-finalists. Those entries will be posted on the site in mid-January, when visitors can view and vote for their favorite. I can’t be bribed so you must go to the site and just get your entry posted!